After 35 years in business we've gotten quite a few rants and raves regarding our cases here is a small sampling of the raves, we'll leave therants for another time. I got three tuff boxes. All were shipped very quickly and within a week I had them all. Free shipping was a huge plus. I also got a personal phone call to thanks me for using them and asked how they could be help me in the future. 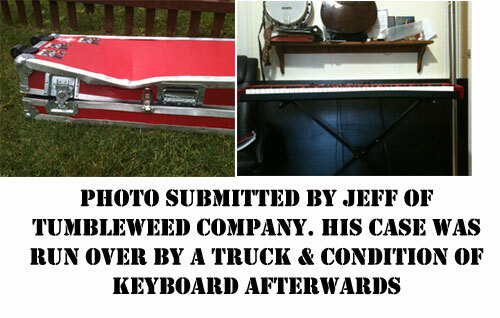 I will recommend and purchase from Road Cases USA a lot more in the future. Thanks. *got the case! fantastic work guys! when my band gets more money, we will order from you guys. excellent work. * Great case at a reasonable price. Fast shipping too!! * just as described, and received promptly. * Great product - wonderful communication. I'd let this guy date my sister. * I HAVE SEVERAL CASES FROM THEM!! AS DESCRIBED!!! * Fast shipping! Great product and company! * Wonderful to deal with ....great communication!! * I got so fast I can go to another states with my new case . Very good case !!! * Excellent Experience, Good Communication, Fast Turn Around, Great Product! * excellent prompt shipment this deserves a WOW!